A pointer to the MEBase object which generated this SubProcess. A pointer to the collision to which this sub-process belongs. The pair of incoming partons. A reference to the vector of intermediate partons. A reference to the vector of outgoing particles. Set the vector of outgoing particles. Set the vector of intermediate particles. Remove a particle entry from this sub-process. Return a clone of this sub process. True if a perturbative cascade has been applied to this sub process. Set to true if a perturbative cascade has been applied to this sub process. Perform a LorentzTransformation of all particles in the sub process. A pointer to the MEBase object which generated this sub-process. The pair of incoming particles. The vector of intermediate particles,. The vector of outgoing particles. The ClassTraits<SubProcess> class must be a friend to be able to use the private default constructor. A SubProcess object represents a hard sub-process in a collision. It carries information about the incoming and outgoing particles, as well as possible intermediate ones. It also has a pointer to the MEBase object which generated the sub-process. Definition at line 33 of file SubProcess.h. newIncoming the two incoming partons. newCollision the Collision to which this SubProcess belongs. newHandler the MEBase object which generated this SubProcess. Add a particle to the list of intermediate ones. If fixrelations is true the mother daughter pointers will be set to/from the incoming partons. Add a particle to the list of outgoing ones. If this SubProcess belongs to a SubProcessGroup, return its relative weight w.r.t. Definition at line 159 of file SubProcess.h. If this SubProcess belongs to a SubProcessGroup, set its relative weight w.r.t. Definition at line 166 of file SubProcess.h. References rebind(), theGroupWeight, and transform(). Return the head SubProcess, if this SubProcess object belongs to a SubProcessGroup. Return NULL if head of a SubProcessGroup or not member of a SubProcessGroup at all. Definition at line 147 of file SubProcess.h. When a SubProcess is cloned, a shallow copy is done first, then all Particles etc, are cloned, and finally this method is used to see to that the pointers in the cloned SubProcess points to the cloned Particles etc. Return the value of the Mandelstam variable in this SubProcess. It is calculated using the incoming particles. Definition at line 192 of file SubProcess.h. It is calculated using the first incoming and first outgoing particle. Definition at line 201 of file SubProcess.h. It is calculated using the first incoming and last outgoing particle. Definition at line 210 of file SubProcess.h. References incoming(), Init(), outgoing(), persistentInput(), and persistentOutput(). Definition at line 40 of file SubProcess.h. Definition at line 38 of file SubProcess.h. Definition at line 42 of file SubProcess.h. If this SubProcess belongs to a SubProcessGroup, this gives its relative weight w.r.t. Definition at line 276 of file SubProcess.h. 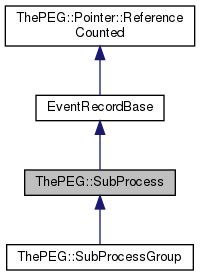 The head SubProcess, if this SubProcess object belongs to a SubProcessGroup. NULL if head of a SubProcessGroup or not member of a SubProcessGroup at all. Definition at line 269 of file SubProcess.h.